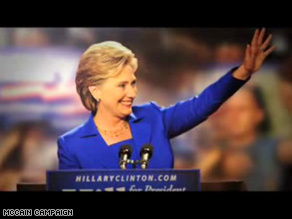 Clinton is the star of a new McCain campaign ad. (CNN) - John McCain’s campaign is making its boldest pitch yet for disaffected supporters of former presidential candidate Hillary Clinton, releasing a new TV ad Sunday that claims Barack Obama’s discomfort with her honesty cost her a spot on the Democratic ticket. The spot uses primary season footage of the New York senator criticizing Obama’s policy proposals ("You never hear the specifics"), his links to convicted Chicago developer Tony Rezko ("We still don't have a lot of answers about Senator Obama"), and his campaign trail attacks ("Senator Obama's campaign has become increasingly negative"). The spot was officially released at 3 a.m. - the hour that became a campaign catch-phrase after a Clinton ad asked voters who they’d like answering the phone in the Oval Office if a crisis broke in the middle of the night. In the wake of the announcement of Joe Biden’s selection as Obama’s running mate, some Clinton supporters have expressed outrage at news the New York senator was not vetted for the vice presidency by Obama aides - a report that seems to suggest she was never seriously considered. The new 30-second spot is part of a major, months-long campaign by the McCain team to reach these voters. Soon after Clinton ended her presidential run, McCain’s campaign launched a special outreach effort, headed by Democratic-turned-independent Senator Joe Lieberman, to woo disgruntled backers of her White House bid. Clinton’s team immediately dubbed the ad misleading. "Hillary Clinton's support of Barack Obama is pretty clear,” said Clinton spokeswoman Kathleen Strand. “She has said repeatedly that Barack Obama and she share a commitment to changing the direction of the country, getting us out of Iraq, and expanding access to health care. John McCain doesn't. It's interesting how those remarks didn't make it into his ad." The spot is McCain’s second of the weekend to feature criticism of Obama by his primary season rivals. On Saturday, the McCain camp launched a spot spotlighting comments by former presidential candidate and current Obama running mate Joe Biden, who suggested during the primary season that the Illinois senator was not ready for the presidency. More rediculuous propoganda that, sadly, our uneducated electorate will buy into - especially those mad Hillary Clinton supporters. No one knows the real inside story. Maybe Clinton didn't want to be Obama's VP. Maybe Obama and Clinton have made other arrangements if Obama becomes president (Cabinet, possible Supreme Court nomination, etc.). No one knows. However, if the Hillary Clinton supporters are really Hillary Clinton supporters, then they will (1) Do as she requests of them, which is support Barack Obama (2) help pay down her debt. But, by no means is Obama being the Democratic nominee for president his fault; he did nothing wrong nor illegal. And I find it disrespectful and selfish that anyone who would vote for Hillary Clinton would now vote for John McCain even though they are antagonists on almost all policy while Clinton and Obama agree on nearly every policy issue. Voting for John McCain, as he himself would say, would not be putting country first. Senator Biden is an awesome choice for vice president. I am ashamed to call myself a democrat; because of all those outraged Hillary supporters. They are so angry and hurt because she was out campaign by Obama. I admit both candidates Senator Clinton and Senator Obama both played dirty both one were dirtier than the other. Now, if the shoe was on the other foot, Obama had lost to Clinton. Obama would have been gracious and wholeheartly supported Hillary and his supporters for president. These angry dems say they are voting for McCain or not going vote for president is election because he did not pick Hillary as vp should be ashamed. Obama has the right to pick whomever he chooses. He chose Senator Biden a great choice. You are dems that are playing right into the Republican hands. This is what they want to see a house divided. I prayed that we all come together and win this election because another four years under republican reign is terrible thing to waste. You guys rather see McCain win this election and for more American families to hurt and suffer than to vote for Obama the Democratic Nominee. McCain policies do not help the working families only the wealthy families. So really think before you vote for McCain or not vote in angry because your candidate is not on the ticket. How was she snub. She has a fruad court case coming up, her husband has millions in the bank he won't account for, and her underlings have been secretly bashing Obama b/c to deflect from them running her campaign into the ground. The McCain campaign is showing the Clintons more respect than that other guy running for president, whats-his-name? I guess my Democratic vote will be for McCain in November. Nice try, McCain. But those of us upset at Obama will never vote for you. We'll go independent first, or maybe Libertarian. HHmmm. So, why did he pick Biden then? I thought Biden was "his biggest critic"? Make up your mind, McConfusion. Mrs Clinton and her faithful lot should grow up. Who do these people owe their loyalty to, anyway? Is it Clinton or the UNITED states of Amarica. If these so called Hilary supporters had anything to do, they would have done it in the primaries. A greater majority them support Obama anyway, so these few lot can etiher join the winning team or live with their conscience for the rest of their lives. I hope Americans are aware that the WHOLE WORLD (including the remotest places) is watching their judgement. Here we go. the old divide and conquer trick. don't fall for it people! War Hero McCain is correct! And then Hussein Nobama picked the biggest politics as usual person in D. C. to be his running mate. So much for his fraudulent claims of change. Proven fact! Obamabots you were fooled by a cult leader. The teleprompter messiah. Another Proven fact! THANK YOU MCCAIN FOR SHOWING US SUPPORTERS THE RESPECT WE SHOULD BE GETTING FROM OBAMA! I know many Hillary fans that will be supporting McCain this election cycle. We don't even recognize the democratic party anymore. McCain don't know anything. Let him pick Mitt Romney. He want win in the South. The Southern people don't like Mormons. So if he choose pretty boy Mitt. He will loose for sure. He better pay more attention to his own choice for VP. Have the media forgot Mitt didn't win any Southern States. So tell McCain to worrry about that. Seanie, you should be ashamed to call yourself a Democrat, I know I am. True Democrats don't vote for the Cheney Energy bill, FISA, or support off shore drilling. Since Obama supported all those things, I'm glad you're ashamed! I would be if I supported him! on this board. If you believe in what Hillary says and she did not get the nomination, why would I vote for some one like John McCain who is just the opposite of Hillary. I have two son's and Mc Cain will not get his hands on them in this draft he's talking about! a sad, sad day when we're left with mc-0 =zero. I truly felt hillery's honesty and sincerity. too bad she didn't have the $$ to keep up with 0. and where did all the $$ come from??? Must they twist everything? HRC was not selected because she does not qualify. So much for "experience." This just goes to show that the GOP candidate has no substance. We already know how much Republicans dislike Obama. When is McCain going to run ads about his issues. I really think McCain campaign firmly believes that the American people are sheep that will easily be persuaded by negative smears and falsehoods about Obama. I may not agree with Obama on all issues, but this independent is not willing to spend 4 more years under Bush/McCain rule.